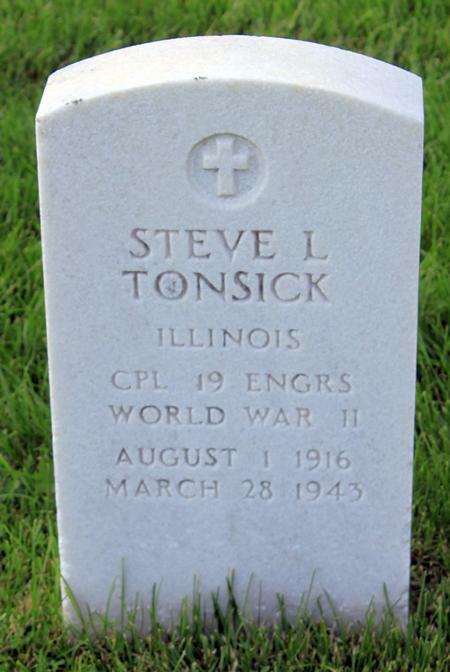 Steve L. Tonsick, son of Mr. and Mrs. Jacob Tonsick, grew up in Granite City, Illinois, about 10 miles north of St. Louis, and was signed by the St. Louis Cardinals in 1937. That year he played first base for the Monett Red Birds of the Class D Arkansas-Missouri League, and batted .232 in 106 games with two home runs and 35 RBIs. Tonsick retired from the game after one season and worked as a checker for the Granite City Steel Company, but continued to play semi-pro baseball with the East St. Louis Hufschmidts of the Illinois-Missouri League. He entered military service on June 14, 1941, and arrived in North Africa with Company C of the 19th Engineer Regiment (Combat) in November 1942. The 19th Engineers were in North Africa to maintain roads and deal with minefields as well as performing their secondary role as infantrymen. It was in that latter capacity that they organized a defensive line at Kasserine Pass in Tunisia, on February 16, 1943, after German forces had attacked the 1st Armored Division, inflicting heavy casualties and forcing their withdrawal. The Kasserine Pass was a mile-wide valley that separated the Grande Dorsale from the open plains of the Foussana Basin. Through it ran a road, a railway, and the River Hatab. At the top of the pass the road forked: right to Thala, and left to Tebessa. Colonel Anderson Moore, commander of the 19th Engineers, had 2,000 men of the 26th Infantry Regiment in addition to his own regiment of 1,200 engineers, but neither had much in the way of heavy firepower. The engineers laid mines then took to the high ground, covering the road to Tebessa. In defending Kasserine Pass against the Afrika Korps, the 19th Engineers' three-day holding action allowed time for reinforcements to take position and stop Rommel by February 22, forcing the Germans to withdraw through the pass. Allied forces then took the offensive and the 19th Engineers removed mines and turned almost 100 miles of trail into dirt roads that the 1st Infantry and 1st Armored Divisions used in their advance. It was during the offensive, on March 28, 1943, that Corporal Tonsick was killed in action. Tonsick was originally buried in North Africa. His body was returned to the United States in 1948 and rests at Camp Butler National Cemetery in Springfield, Illinois. Steve's brother Rudolph also lost his life, while serving with the Navy in the Pacific in December 1944. Another brother, Albert, who also served with the Navy, played minor league baseball from 1948 to 1950. Thanks to Michael Hillmer at the Six Mile Regional Library District, Granite City, Illinois, and Davis O. Barker for help with this biography. Thanks also to Astrid van Erp for help with a photo for this biography.